Is It Worth Visiting Chiang Mai On A Short Trip To Thailand? Chiang Mai is a very popular destination for people who are spending a minimum of two weeks in Thailand or travelling on an extended trip around Southeast Asia. In this scenario, it is worth going to Chiang Mai as all of the positives below should be experienced. The real question is, is Chiang Mai worth visiting if you’re going to Thailand for two weeks? Read: Best Area To Stay In Chiang Mai. Presumably you are going to be landing in Bangkok and heading to the various islands and beaches in Thailand. In this situation, you are a long, long way from Chiang Mai. If you are on a tight budget and short on time, you will most likely be getting around Thailand overland. In this case, you should probably skip Chiang Mai. You’ll spend a minimum of 20 additional hours on transport alone (minimum time to get from Bangkok to Chiang Mai return). The cost will also be a minimum of 1000 baht if you take the not so great tourist cattle bus. Recommendation: Booking buses and trains in Thailand online*. Time is the main factor for not going to Chiang Mai while in Thailand for less than two weeks. If you don’t mind travelling on overnight trains or buses it becomes a lot more feasible as you won’t be spending money on accommodation (this obviously is redundant if you’re Couch Surfing). There is so much to do in Chiang Mai: Not just Chiang Mai, but other popular destinations within a few hours drive of Chiang Mai are Chiang Rai, Chiang Dao & Pai. If you want to visit all of these destinations, start making plans for a return trip to Thailand to explore Northern Thailand so you can explore the whole region at once. The walking street markets are a big draw card with the Saturday and Sunday being the most popular. Both markets draw 1000’s of people to the various stalls, food offerings and atmosphere. Thailand, and Southeast Asia, in general is full of markets but many people say the Saturday and Sunday markets are the best in Thailand and are the highlight of their Chiang Mai time. If your potential trip to Chiang Mai doesn’t include a Saturday or Sunday night, you are missing out on a possible ‘must see’ in Chiang Mai. If you are coming to Thailand to party, you should give Chiang Mai a miss. The nightlife (in early 2017) is all but dead by the time 1 am rolls around. Clubs will start shutting down by midnight more or less (few exceptions). If you are looking to party with random’s until 6 am, stick to Bangkok and the beach areas of Thailand. If for no other reason than to run up the sticky waterfalls, a very unique experience and a great activity in Chiang Mai for families. Chiang Mai, while touristy is a lot more affordable than other tourist hotspots in Thailand. It is true above that I said the cost of transport is not helpful, but if you stick to street food and cheap restaurants you will quickly make up the difference in funds so depending on how you define ‘worth’ in the question we are addressing, it is worth going to Chiang Mai for the cheap prices. Northern Thai Food Is Delicious. Speaking of food, the Northern Thai Cuisine is insanely popular and makes Chiang Mai worth visiting alone. Some of the Thai dishes native to Northern Thailand are pad Thai, Banana blossom salad, jackfruit curry and sticky rice with mango to name a few. The Tourist Infrastructure is epic. The Chiang Mai old city has a moat around it and for architectural people along it is worth going to Chiang Mai. While I’m sure this wasn’t planned at the time, it is the hub of the tourist activity in the city with more travel agents, massage places, taxis, restaurants and temples you could ever need. This makes the city easy to get things done…whether you want to eat, drink, organise activities or meet fellow travellers. Chiang Mai has something for everyone. While most people can happily lounge around on a beach working on their tan all day, certainly not everyone can do this. Chiang Mai may not have any real beaches but there are still plenty of water-based experiences. And there are cooking classes, cat cafes, art museums, hikes just to get you started. With a bare minimum of 50 epic activities, you’ll find plenty of activities to excite you! Chiang Mai has the best Elephant experiences in Thailand. The best elephant experience is not getting a selfie while riding an elephant. Nice elephant experiences are where you get to look after the elephants where they are not treated cruelly making your elephant interactions all the more special. There are several great places where you can spend your elephant time in Chiang Mai with the most popular being the Elephant Nature Reserve. Be Prepared: Book a few of your activities in advance. 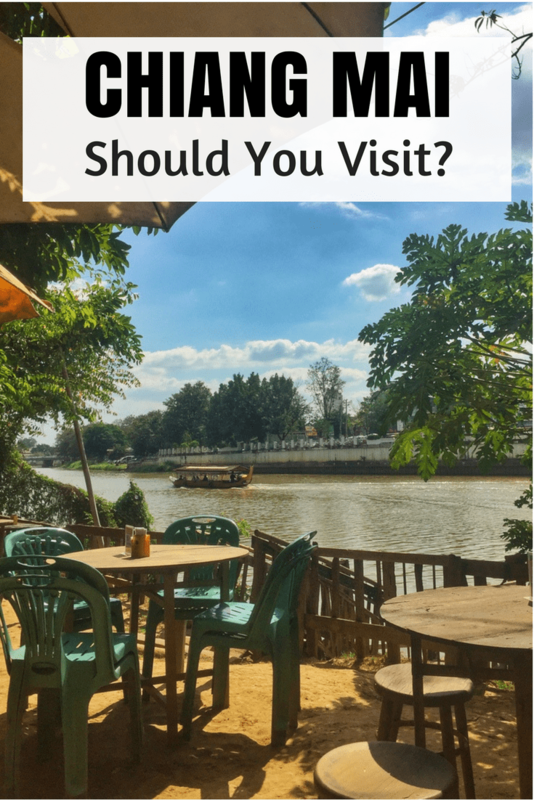 So Is It Worth Going To Chiang Mai? If you don’t mind overnight travel and are prepared to eat local food while not missing beachside cocktails to wake up from your bucket induced hangover from the night before Chiang Mai is worth it. You can have magical elephant time while getting a bunch of your bucket list activities completed with epic new tasting meals you will share with new friends you meet in Chiang Mai. * The tickets purchased via 12Go.asia are more than booking in person at the bus and train station. You need to consider the cost of getting to the bus/train station and the time you invest in that.